Four channels of MIDI generated CV (CV1 to CV4). CV1 to CV3 available directly to the matrix via Input Ch 1/Ch 2 and row 16. CV1 to CV4 are also available via a special cable that connects to the unit with four EMS patch pins on one end and a mini-DIN plug on the other. The CVs are connected to the tip of the pins only and the cable allows CV1 to CV4 to be injected into any of the Synthi control inputs (i.e. matrix columns). The pins are colour coded with green, blue and yellow corresponding to CV1 to CV3 and black to CV4. The reason for this cable is that CV1 to CV4 can be used even when control of the Synthi input channels is through the attached KS keyboard. So it is possible, for example, to use the KS sequencer keyboard and still have CV1 to CV4 available via the matrix pin cable to add dynamic envelopes created via MIDI for filter control, reverb mix, output channel and level envelopes. Here is a small demo MP3 made on a VCS3 Mk2 using the Synthi Quad MIDI-CV interface. The play mode is 'mono mode' with CV1 given by MIDI note, CV2 by note velocity, CV3 MIDI modulation wheel and CV4 MIDI pan. CV1 is controlling osc1 pitch, CV2: osc2 pitch and CV3: osc3 pitch (with invert option on). CV4 is used via the patch pin cable to control filter cutoff. So basically the unit is sending polyphonic sequences to the VCS3. Demo Your browser does not support the audio element. As an example of its use, three of the four channels being used to inject CV1 to CV3 into the matrix (Input Ch 1, Input Ch 2 and row 16) and the fourth channel used to offer novel triggering modes of the ES. The unit derives its power from Synthi AKS and is about 100mA mainly from the +12V side of the power rail. The unit will of course work with the VCS3 (Mk2) and DK1/2 keyboard... but we offer a special version for VCS3s in an Afroromosia hardwood case to match the VCS3 styling. 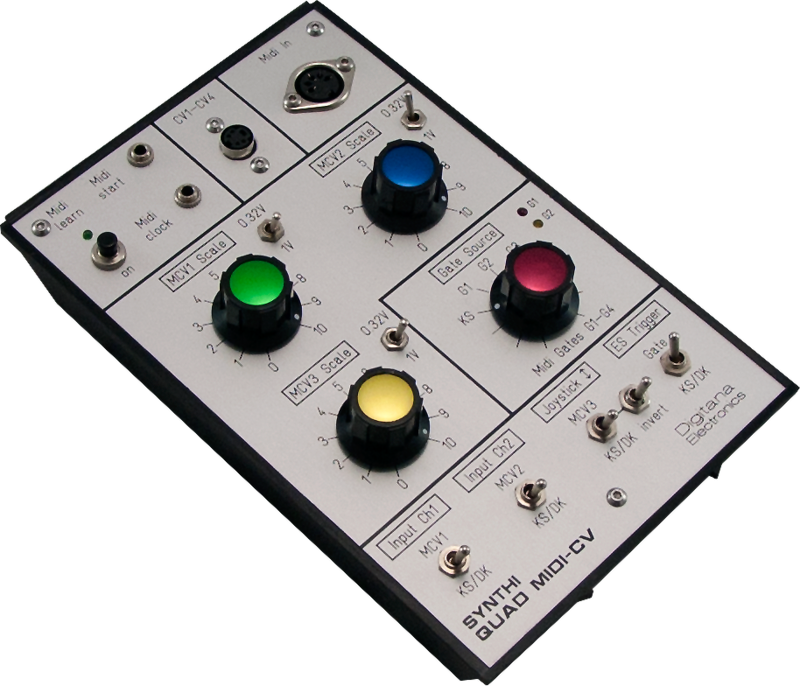 See Synthi VCS3 Quad MIDI-CV for more details.